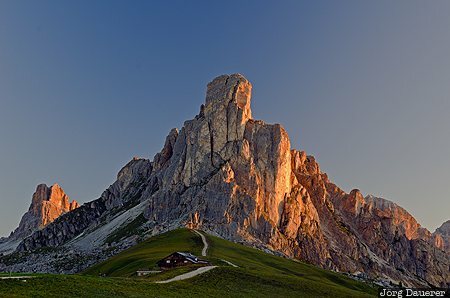 Monte Nuvolau illuminated by warm morning light seen from Passo di Giau. Passo di Giau is in Veneto in northern Italy. This photo was taken in the morning of a sunny day in August of 2014. This photo is in the Photo Calendar "Alps". This photo was taken with a digital camera.